Change and tradition are twin conflicting forces that can help to propel creativity and develop our cultural heritage. 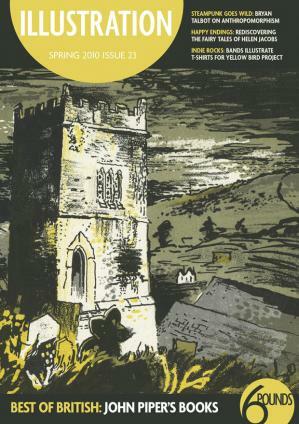 As we start the second decade of the 21st century we look forwards while cherishing the past when we highlight the evocative illustrations of John Piper and enjoy the way in which he celebrated British architecture and countryside in his books, while avoiding any suggestion of the twee or the “chocolate box”. We remain in the past when we revisit the images of fairy tales and children’s stories by Helen Jacobs, but then look at how such nostalgic illustrations can be used in a 21st-century context when we explore the working collection of the Mary Evans Picture Library and find out why its curators believe that the digital age needs to understand the visual influences of the past. One artist who needs no persuasion is Bryan Talbot. He explains how his ground-breaking graphic novels build on great illustrators of the 19th and 20th centuries and why he constantly takes photographs and collects resources that help to root his “steampunk” visions in historical reality. “Madame Majeska”, by contrast, created risqué images that today conform to our expectations of art deco design. Meanwhile, Russian artist Dmitry Sayenko is using the most traditional techniques to create books that draw on the oldest classical legends as well as the Russian graphic traditions of the 20th century. Of course, modern illustration has to develop in new ways and formats to reach out to non-traditional audiences. This is why the Yellow Bird Project is enjoying success with t-shirts designed by illustrators for their favourite indie bands and sold for charity. The project continues to branch out and is now producing colouring books and online games, all based firmly on the traditional visual language of illustration. We hope this mix of old and new inspires your plans for 2010.